It isn’t always easy to stay on a budget when planning family activities. A trip to the movies these days can run a family upwards of $50 if they splurge on snacks! Luckily, there are many free and discounted activities awaiting your family’s enjoyment – many of which provide a learning opportunity as well! Take a peek at some of my favorites and feel free to add your own in the comments. With our collaborative brainstorm, we’ll all be having frugal fun in the coming months! At-Home Movie Night. Speaking of movies, why not rent a family-friendly movie, dim the lights, and snuggle on the couch with popcorn for your own version of the movies? Farmer’s Market. 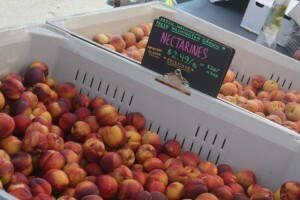 What’s not to love about the farmer’s market? Local, delicious food at your fingertips and a chance for your children to learn from the farmers themselves where real food comes from. Chores. Yes, it is true, chores can have an element of fun. I spent many a Saturday growing up with my chore assignment, the radio blasting, and my entire family dancing around as we got busy cleaning the house. Keep, Give, Toss. Have you played this game with your children? Set up three buckets in a room that needs some desperate organization and piece by piece decide what items are worth keeping, what items could be given to others or donated to a charity, and finally, what items are ready to retire via the garbage or recycling. Library Story Time. The library (and other community centers) offer a plethora of activities for children of all ages. 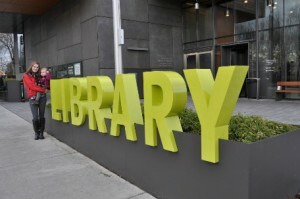 Pick up your local libraries schedule and make it a weekly or monthly event. Supermarket Classes. Many natural supermarkets have some type of meeting room or learning center. Throughout the month they offer classes, many tailored for children, and usually for free or just the cost of materials. Holiday or Themed Play Dates. Play dates with other families are always fun, but what is even better is a party surrounding a particular holiday or theme. Consider hosting a snack potluck party this month … it could be Wild West theme with barbeque, potato wedges, and chili, or a Welcome Summer party with homemade popsicles as an activity. Scavenger Hunt. Create a list (if your children are readers) or picture cards and send your children searching around the house for particular items. Step it up a notch by having them take pictures or video of their finds instead of actually collecting them. Discount Days at the Zoo & Museums. Many zoos have discount days, for example, the Oregon Zoo hosts a $4 admission on the second Tuesday of every month – what does your local zoo offer? Museum Day Live! is September 25th this year and is a free peek into many cultural, historical, and science museums – stay updated on information here. Copycat Craft Day. Pinterest is such a source of inspiration for children’s crafts! Take a gander and plan a craft morning or afternoon. Music in the Park. When the weather brightens up touch base with your local Parks and Recreation Department and see what parks are hosting summer concerts. Parks and Rec is also a great resource for other events such as after dusk movies, holiday events, parades, fairs, and learning opportunities. Window Shopping. Of course, this can be full of temptations as well, but if you go with the intentions to look you’ll experience a whole world of fun. Some stores provide better opportunities than others. For example, Cabela’s is like a mini zoo and outdoor experience rolled into one. Backyard Camping. Set up a tent or sleep under the stars for a camping experience with no cost. If you have a smart phone, the app Star Walk offers a virtual constellation finder. As you can see, family fun can easily be free! What are your favorite frugal activities throughout the year? Our library offers a music program where they have a different musician guest on particular days! We have a museum here with a kid program one Saturday per month. They do an art project and give art supplies away! Photography “dates” are one of my all-time favorite cheap dates / outings! Pick a location or theme (downtown, bridges, cemeteries, etc) or you can even do a photo scavenger hunt! I’ve only seen that last one done with teams of people. I love all those ideas! Might even mention to our library about a music program … that’s sounds fabulous! We LOVE library programs and storytime at the nature center and visiting the museum etc. We are very lucky to live somewhere with lots of free options. I also think geocaching and letterboxing can be lots of fun with kids if they are interested! What is letterboxing? I’ve never heard of it! Those are amazing ideas! I specially like the Music in the Part idea as it gives kids the chance to enjoy the part while listening to great music.